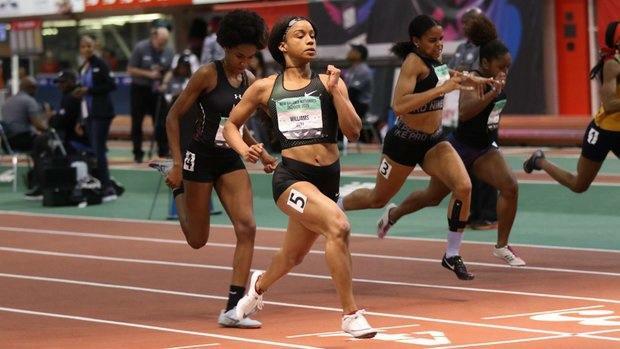 Recently crowned a national champion at 60 meters this past weekend at New Balance Nationals Indoor, Briana Williams now has her focus squarely on the goal at hand this summer: Qualifying for the World Championships in Doha for Jamaica. And the road to Doha won't include the outdoor state qualifying system in Florida, as Williams' coach, Ato Boldon, confirmed to MileSplit that he won't risk the travel and wear and tear of district and regional qualifiers on Williams ahead of Jamaica's Senior Track and Field Championships from June 20-23. The 16-year-old Williams, who turns 17 in a little over a week's time and attends Northeast High School in Oakland Park, Florida, has ambitions far beyond winning another high school state championship in the Sunshine State, and that includes qualifying for the Jamaican Senior team in either the 100 or 200 meter dashes. Planning starts as early as this weekend, as Boldon has pulled Williams from the Bob Hayes Invitational in Jacksonville based off a recommendation from her doctor and the chance for rain on Saturday. It was at this venue a year ago where Williams, still just 15 years old, set a world age group record at 100 meters in 11.13 seconds. I've pulled @brianastarr21 out of the Bob Hayes meet in Jacksonville due to a combination of the bad weather forecast for this Saturday and advice given to me from her physio after her #nbnationals 60m win at @ArmoryNYC last week. Unfortunately, that scratch has a prompted a calculus shift in Florida sprinting: In effect, it ended Williams' career in a Northeast uniform. Boldon said Williams is unlikely to race again for Northeast in an open race and that her performances at the Florida Outdoor State Championships in 2018 were her last in the state's outdoor high school circuit. Williams, a junior at Northeast, ran her last two races for the program on Feb. 23 and March 2, with the latter seeing Williams clock a US No. 1 time of 23.29 seconds. Based on the nature of fast-moving deals in track and field for young elite athletes, much could change in the coming months following performances at these big meets. Williams still has one more year of high school left following her junior year at Northeast. But with a historic performance over the summer, Williams' career could skyrocket upward, forcing corollary decisions to be made. Boldon has long been adamant that every race for Williams have a purpose, and following the transfer of sophomore Tamari Davis from Class 3A Gainesville to Class 1A Oak Hall, there remains little reason for the high school junior to race anyone else individually in high school, he said. However, Boldon did say Williams could feature for Northeast in the 4x100 relay. In 2018, Williams won the outdoor Class 3A 100 meter title in 11.31 seconds and was second to Davis in the 200m meter race, finishing in 23.15 seconds. She later went on to win national-level 100 meter races at the adidas Boston Boost Games (11.35) and The Great Southwest Classic (11.25) before going on to score two golds at the IAAF U20 Championships in Finland for Jamaica, running to wind-legal times of 11.16 and 22.50. Previously to those competitions, Williams scored a 15-year-old world age group record at 100 meters in 11.13 seconds at the Bob Hayes Invitational. Boldon said Williams will once again focus on high-level racing in 2019 and will consider racing at the Flo Golden South Classic, the adidas Boston Boost Games, Great Southwest, or The Prefontaine Classic -- which will take place after the Jamaican Senior Championships.